Bishop Leslie Rogers Tomlinson was born on 27 August 1943 at Mildura Victoria, the third child of Edward Tomlinson and Alice Rogers. Primary Education was at Sacred Heart School, Mildura, followed by Secondary Education at St Joseph’s College, Mildura. Prior to entering the seminary Bishop Tomlinson undertook clerical work in Irymple and at Melbourne. At the beginning of 1968 he commenced studies for the Priesthood at Corpus College Werribee. At the invitation of the then Archbishop James Knox, he became one of the initial class of St Paul’s National Seminary Kensington NSW. Bishop Ronald Mulkearns ordained him to the Priesthood for the Archdiocese of Melbourne at St Joseph’s Church, Red Cliffs on 18th August 1972. Following ordination he was Assistant Priest at Mitcham for three years before being loaned to the Archdiocese of Hobart for three years. Returning to Melbourne he served as Assistant Priest in North Dandenong and Sunshine before being appointed successively as Parish Priest of Carlton, Rowville and Ormond. 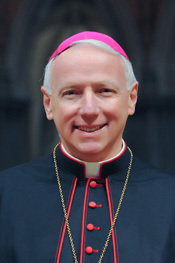 Bishop Tomlinson was Dean of St Patrick’s Cathedral for four months prior to being appointed Vicar General and Moderator of the Curia, in April of 2003, an appointment he has held to the present. Pope John Paul II named him as a Prelate of Honour on 27 May 2003. Bishop Tomlinson is also Secretary of the College of Diocesan Consultors, Chairman of the Personnel Advisory Board, Deputy Chairman of the Diocesan Planning and Development Fund, Deputy Chairman of the Diocesan Finance Council and Chairman of the Catholic Capital Grants Company and the Chairman the Diocesan Planning, Building and Finance Committee. He is Secretary of the Roman Catholic Trusts’ Corporation for the Diocese of Melbourne. Earlier, he had been an active member of the St Patrick’s Cathedral Works Committee (1994 – 1997), involved as committee member and then Secretary of the Priests’ Remuneration Fund (August 1992 – January 2003). He spent some years as State Chaplain to the Knights of the Southern Cross and as the Spiritual Advisor of the State Council of the St Vincent de Paul Society, Victoria. On the 5th May, 2009 he was appointed by Pope Benedict XVI as Titular Bishop of Siniti and Auxiliary Bishop of Melbourne and was ordained a bishop at St Patrick’s Cathedral, Melbourne on the 17th June, 2009. On the 3rd February, 2012, Pope Benedict XVI appointed him as Bishop of Sandhurst.